SureFlap Cat Flap Mounting Adaptor White - Suitable For Glass Doors, Walls etc. Doors4paws Pet Door Surround For Your Ugly Cat Flap. PetSafe Staywell Classic Magnetic Cat Flap. No batteries required and suitable for most installation materials. Suitable for cats up to 7 kg. Available in white. Once inside, the flap can no longer be pushed open as the magnetic key is not present. PetSafe Staywell, Weather Proof, Aluminium Pet Door, Small. WARRANTY - The PetSafe Staywell Aluminium Pet Door includes a 3 year manufacturer's warranty. WEATHER PROOFING - In high Wind the Magnetic closing Door and pile Weather Stripping prevent flapping keeping a Tight, Weather Proof seal around the opening. Wicklow - Staywell® Deluxe Manual Cat Flap - White. The 300EF Cat Flap has a manually operated lock with 4 locking options allowing you maximum flexibilty - in only, out only, opened and locked. This Cat Door has a solid transparent flap with magnetic seal for improved energy efficiency. Staywell Deluxe Manual 4 Way Locking Cat Flap - Wood Grain. Locking options include in only, out only, fully open and fully locked. The Manual cat flap is suitable for any door, wall or material and can be extended to any depth for wall fitting. Mounting adaptor required for glass installations. Flap size (mm) 142 w x 120 h. Selective entry. The height of the physical cat flap is 21cm. 4-way lock: in/out/opened/locked. Used for a few months only. PetSafe Staywell Big Cat / Small Dog (White) - for Sliding Glass & Normal Doors. SLIM PROFILE - The Staywell Big Cat/Small Dog Pet Door is designed for Easy Installation in Sliding and Glass Doors. The PetSafe Staywell Big Cat/ Small Dog Pet Door provides incredible freedom for Pets and owners alike with an Adjustable 4 Way Locking System that can be customised for all your Pet’s needs. Description: Staywell Cat Door and Lock 715 White Pack Size: 1 Details: Small Pet Door - WHITE No more scratched doors. No more getting up late at night. Weather resistant self closing see through magnetic flap. Lockable interior barrier. Fits all walls and wooden doors. For cats up to 7kg (15lbs) and small dogs up to 3kg (7lbs). Overall size: 236mm x 198mm (9 1/4" x 7 3/4"). Cut out size: 180mm x 155mm (7 1/8" x 6 1/8"). Maximum pet shoulder width: 147mm (5 3/4"). 5 out of 5 stars - SureFlap Microchip Cat Flap. 99 product ratings99 product ratings - SureFlap Microchip Cat Flap. The attractive circular styling of this 4-Way locking flap is popular for wooden panel doors in addition to glass and acrylic. Easy to use 4-Way lock. Self lining to 11/4" (30mm) thick. Thickness : Self lining to 11/4", (30mm) thick. A power assisted magnetic cat door. Easy to use 4-Way lock Self lining to 23/8" (60mm) thick - ideal for all doors. Thickness :Self lining to 2 3/8", (60mm). Master Plastics SW Ltd. Available in: White or Brown. Fits 300 320 340 400 420 440 500 520 and 540 Staywell petsafe doors. Transparent Flap includes lower magnet - 143mm h x 153mm wide. PetSafe Staywell Multi-Locking, Manual 4 Way Locking Classic Cat Flap. Locking options include in only, out only, fully open and fully locked. 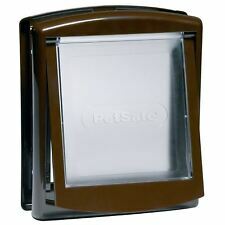 1 x PetSafe Staywell Manual 4 Way Locking Classic Cat Flap. Wicklow - Staywell® Original 2-Way Pet Door - Small White. Supplied with a closing panel for when it’s not in use or for keeping your pet safely indoors. Suitable for most doors and walls. Maximum pet shoulder width: 147mm (53?. ). Petsafe Frolicat Flik Automatique Chat Teaser Corde Jouet PTY17-14233 CAD 38.00. 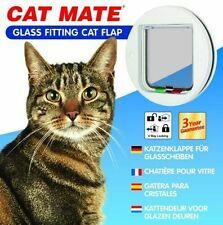 White - Advanced magnetically operated cat flap with a magnetic collar key. 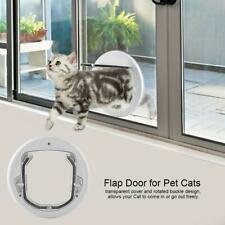 Advanced magnetically operated cat flap with a magnetic collar key. PetSafe Staywell Pet Door. LOW START TO GRAB YOURSELF A BARGAIN!! 4-way Locking. Optional tunnel extension included. White finish with see through rigid flap. Maximum pet weight: 10kg. shoulder width: 180 mm.